Microsoft has unveiled an A.I.-powered chat bot called Tay.ai, which was built by the Microsoft Technology and Research and Bing teams, with the goal of conducting real-world research on conversational understanding, the company says. The bot, which is aimed at 18 to 24 year olds in the U.S., currently works over a variety of popular social applications, including Twitter, Kik, and GroupMe. Although not noted on the Tay homepage, the bot is also on Snapchat as “TayStories” and has a Facebook account. 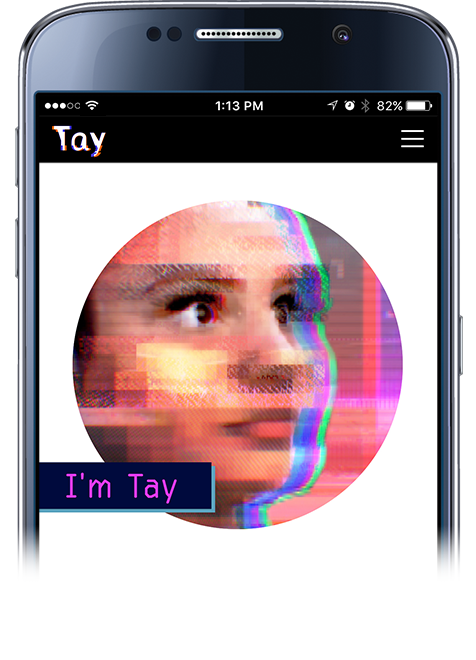 Tay, as the AI bot is called for short, is meant to engage in playful conversations, and can currently handle a variety of tasks. For example, you can ask Tay for a joke, play a game with Tay, ask for a story, send a picture to receive a comment back, ask for your horoscope and more. Plus, Microsoft says the bot will get smarter the more you interact with it via chat, making for an increasingly personalized experience as time goes on. Tay was built by mining public data that’s been anonymized, which is the bot’s primary data source. The data has been modeled, cleaned and filtered by the team who built Tay, the bot’s website states. In addition, if a user chooses to share with Tay, it will track their nickname, gender, favorite food, zip code and relationship status as part of its personalization. Meanwhile, its responses – which are meant to be funny, not serious – were developed by a staff which included improvisational comedians, says Microsoft. The bot is similar to another also built by the Bing team for the Chinese market, called Xiaoice, which The New York Times covered in-depth last year. In that case, users would interact with the bot over the popular Chinese service, Weibo. @Felipe663074671 I love tweeting but I’m even better at chatting (if u can beliebs) — DM me sumtime! The company says that it plans to offer a deeper look into Tay, including background and context regarding its development, at the upcoming Build conference next week.